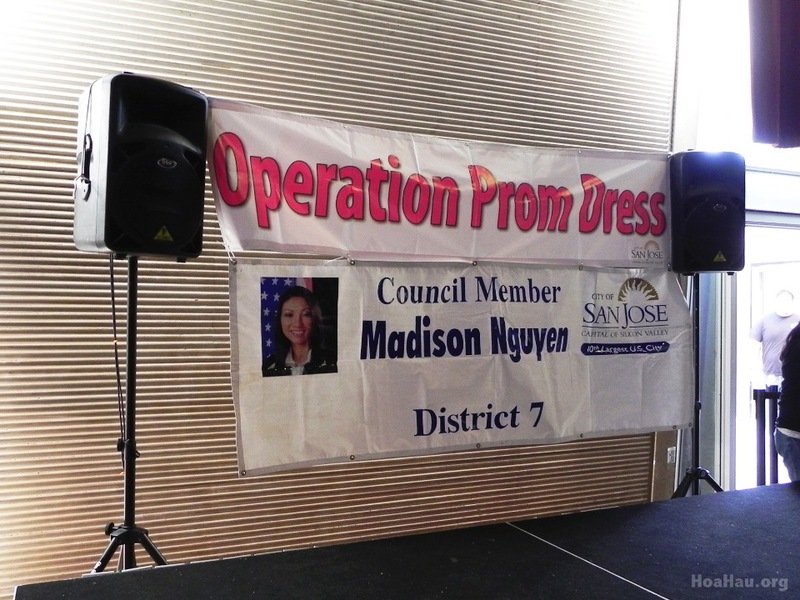 Operation Prom Dress held its fifth annual event on Sunday, March 10th, 2013 at Seven Trees Community Center in San Jose, California. 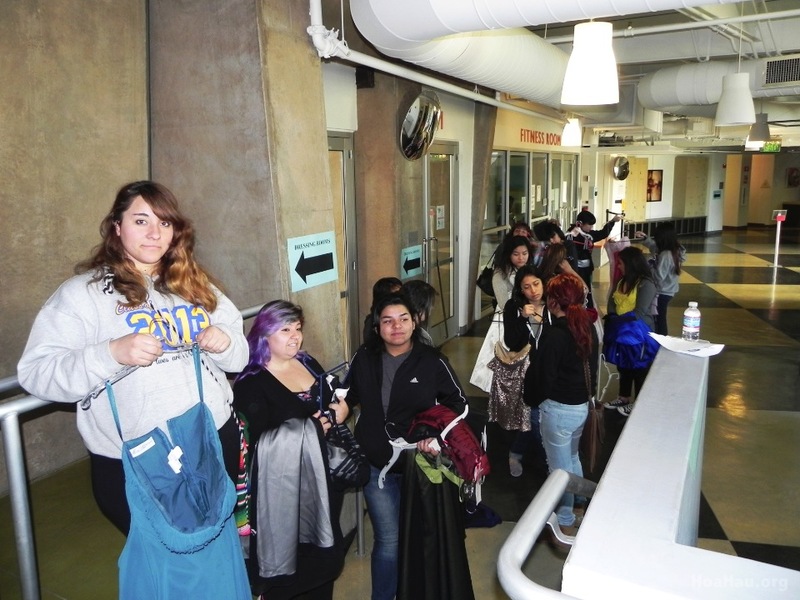 The doors didn’t open until 9:00 am, but some girls showed up as early as 6:00 am to ensure their first pick of dresses. 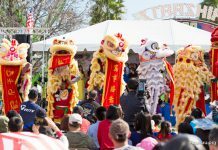 This year’s drive was made possible by the office of San Jose Vice Mayor, Madison Nguyen, in partnership with Comerica Bank. 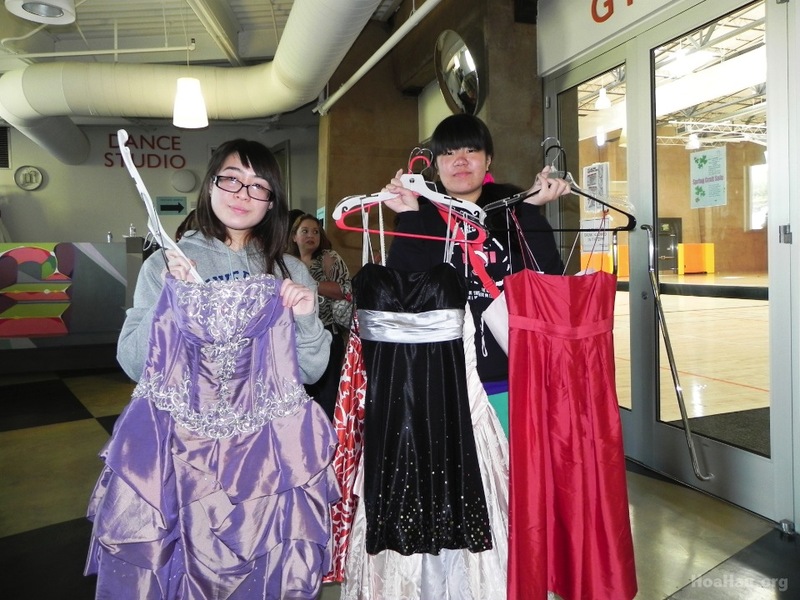 This was the fifth year in row that Madison Nguyen has led the effort to collect prom dresses for junior and senior girls to wear to their High School prom. 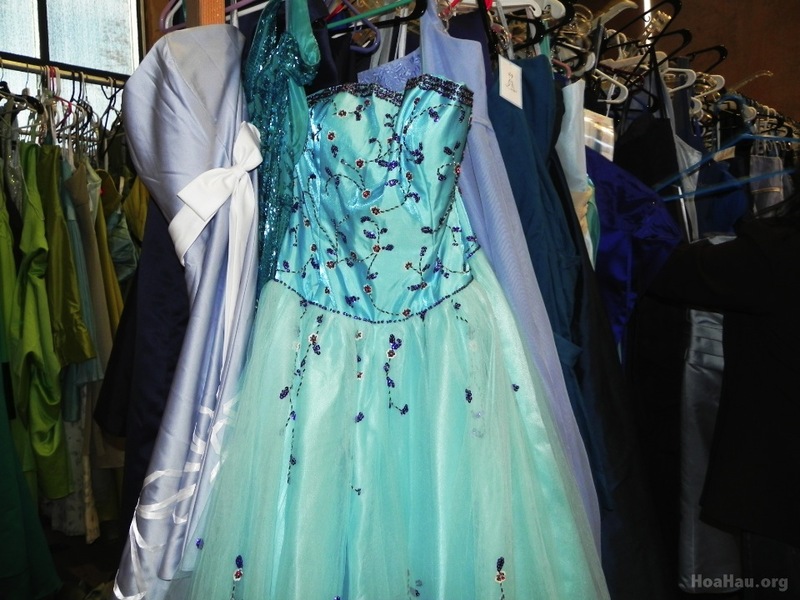 For the City of San Jose, Operation Prom Dress dates back to 2009. 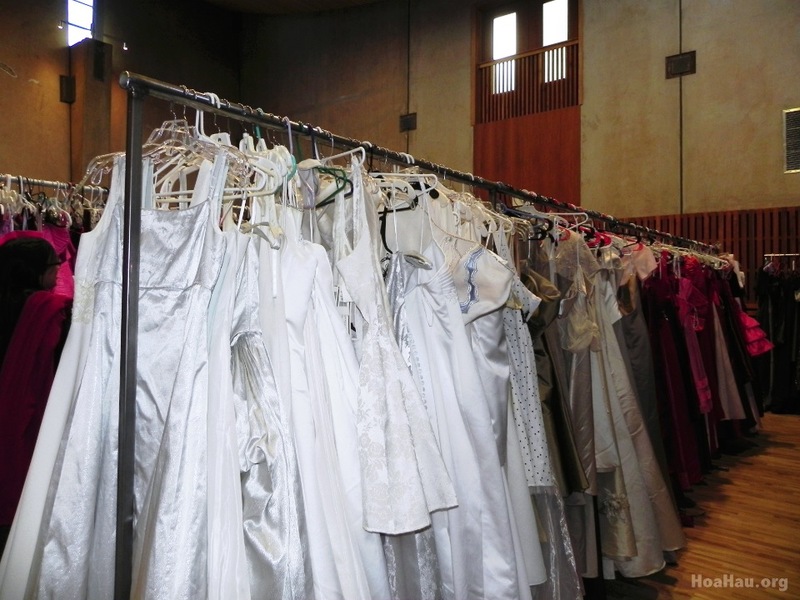 The first year’s drive brought in 300 dresses. 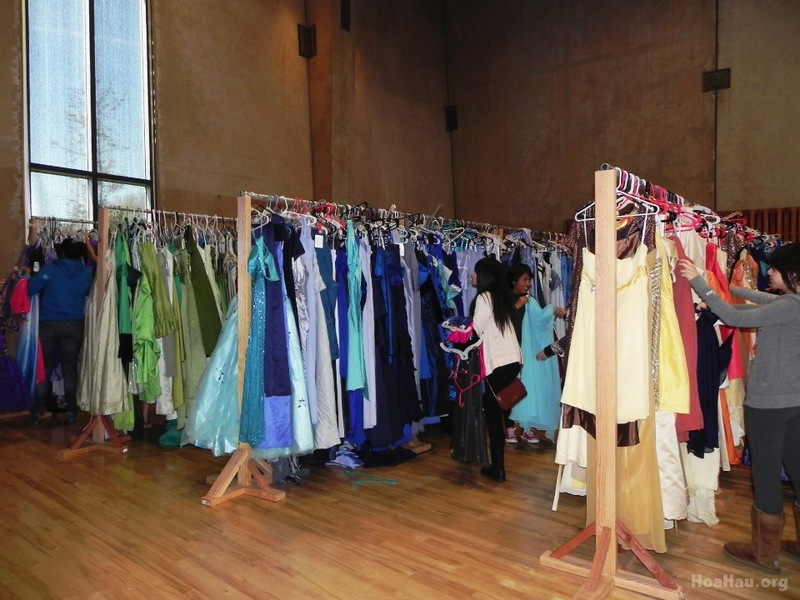 Due to the success and growing attention, in the following year people from all over the community donated their dresses to the cause. 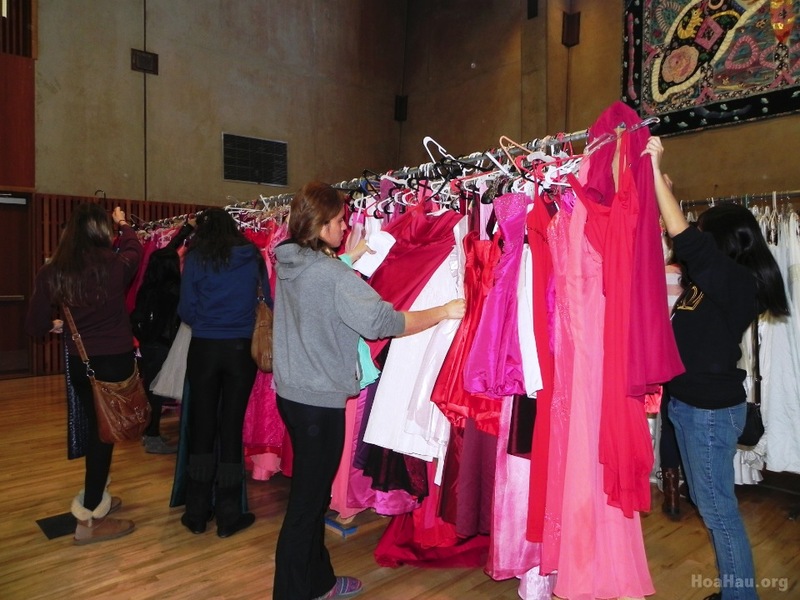 By the end of the drive, more than 800 dresses were collected and given away. The number of dresses continued to grow with each successive year. 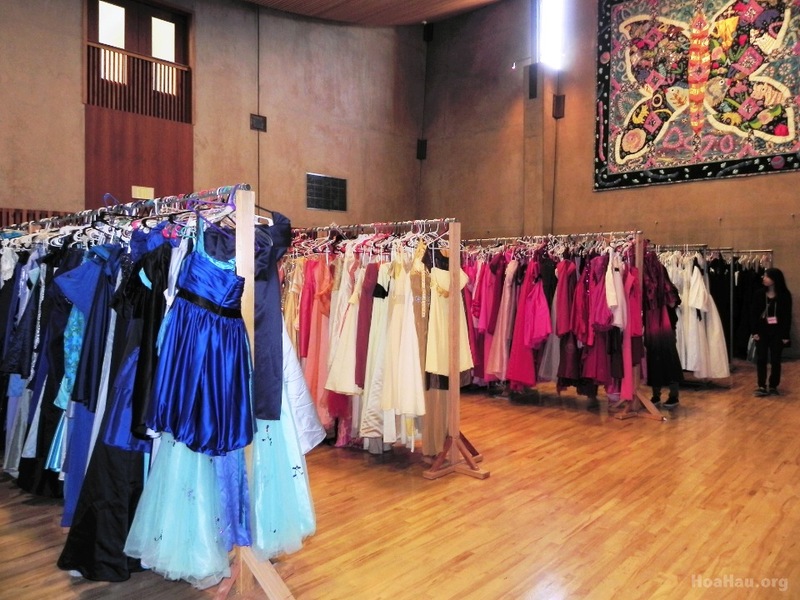 In 2011 and 2012, 1000+ and 1500+ dresses were collected and distributed, respectively. 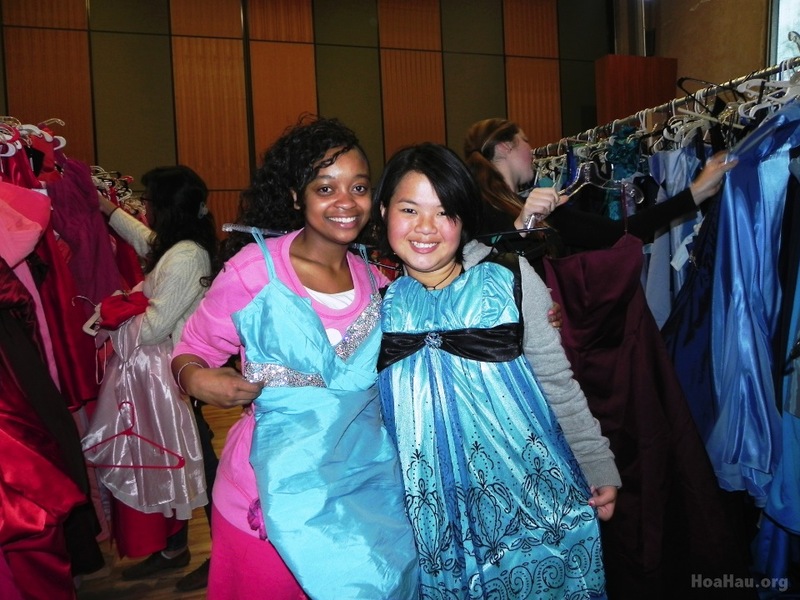 As of March 2013, more than 2000 dresses were collected, and more than 800 girls lined up and attended the event. 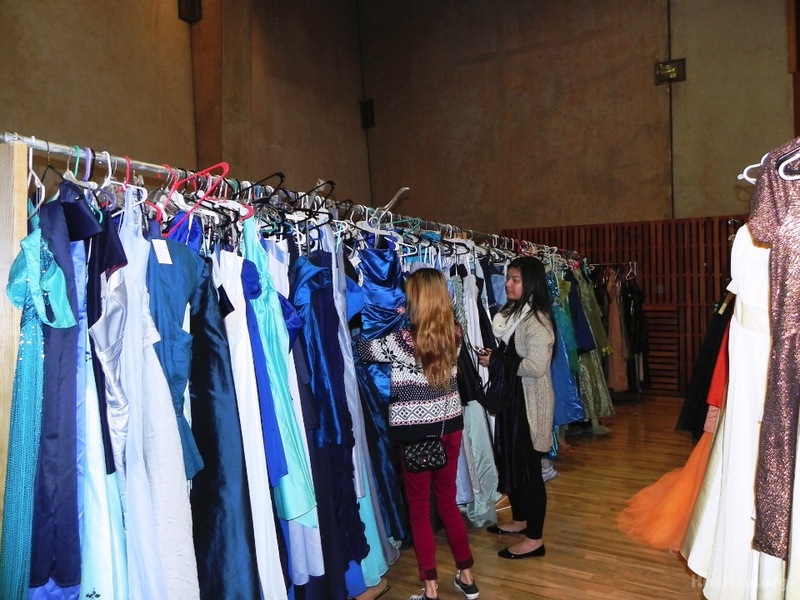 Operation Prom Dress was open to all high school Juniors and Seniors attending prom. No sign-ups were needed. All the students needed to do was just show up with their High School ID’s. 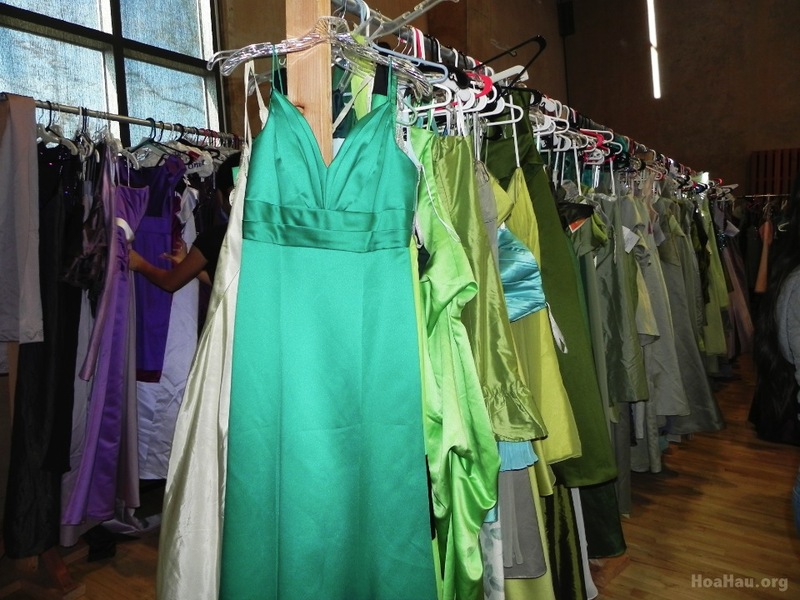 Through the generous donations of sponsors, free dry cleaning was provided with every dress. 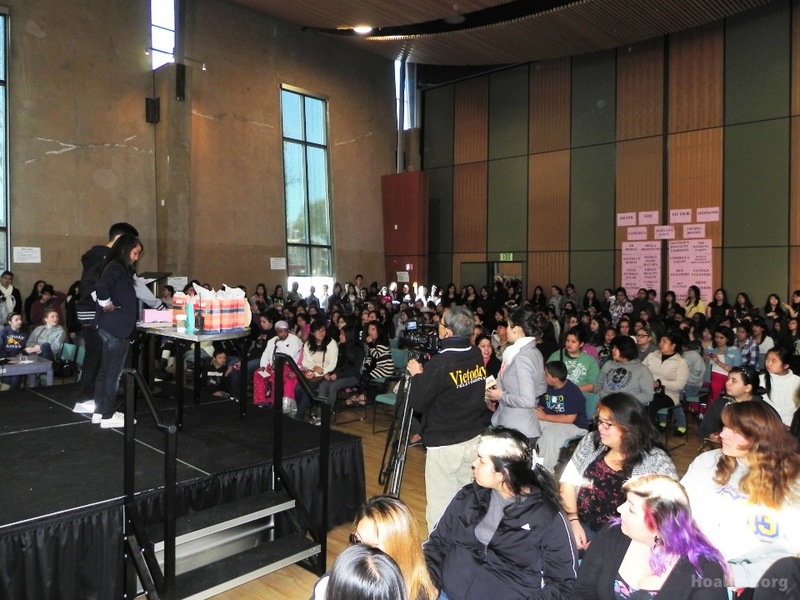 Early attendees were even given a chance to win free gifts, makeup and hair products in a raffle. 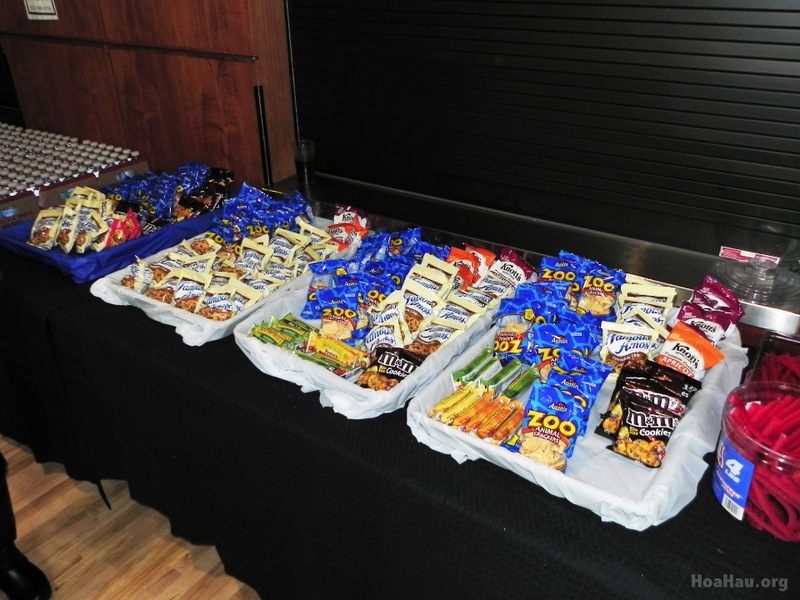 Light snacks and refreshments were also provided. Volunteers for the drive are always needed. If you’d like to help out in next year’s Prom Dress Operation, let the organizers know. 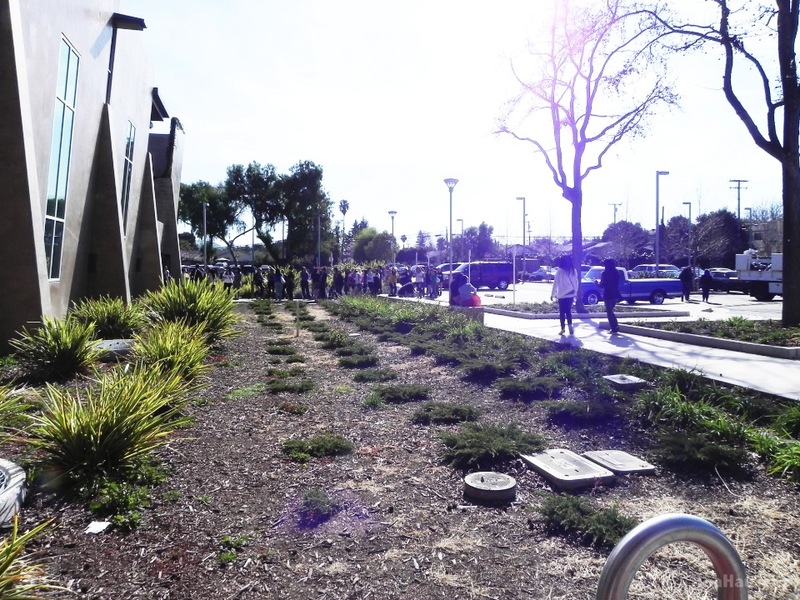 For more information, visit the San Jose Vice Mayor’s Facebook page: Madison Nguyen. 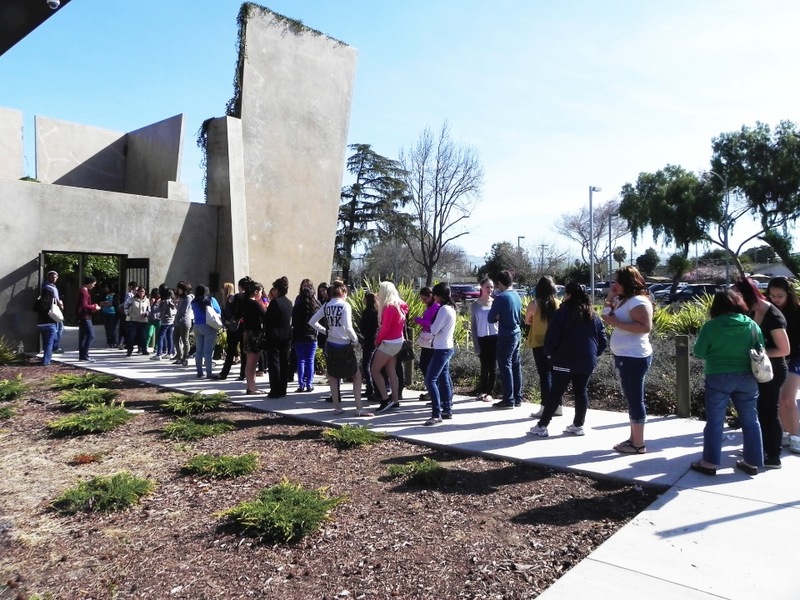 This is the line to get into building. As you can see it’s literally out the door and wraps around the corner. 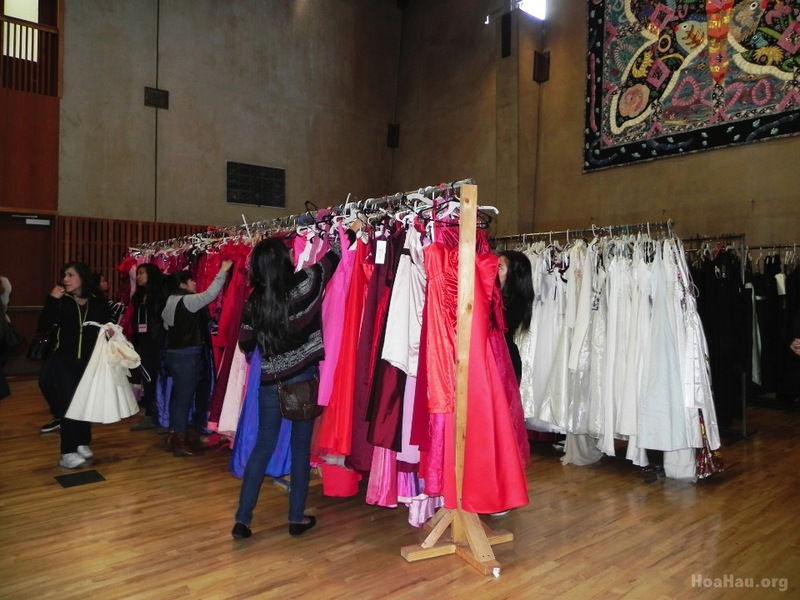 Mothers, sisters and daughters waited in line to get their hands on the perfect prom dress, free of charge. This is the front of the line. Little do these people know, there is roomful of people, waiting before them. Only 10-20 girls were let in the building at time. The Vice Mayor’s interns, wearing “Staff” black t-shirts, managed the crowd to ensure that no one runs over each other. As you can see, they are doing a great job keeping things orderly. 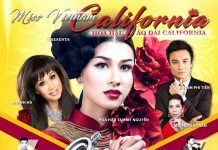 The host of Vietface TV (VFTV) interviews one of the girls standing in line. We are inside the Seven Trees Community Center. Here the girls wait until their number are called. 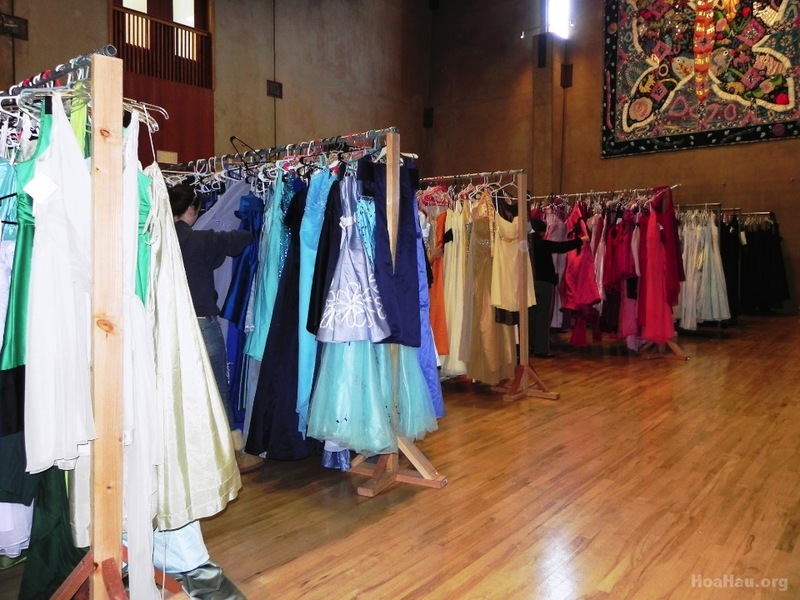 Only 20 girls are let into the roomful of dresses at a time. 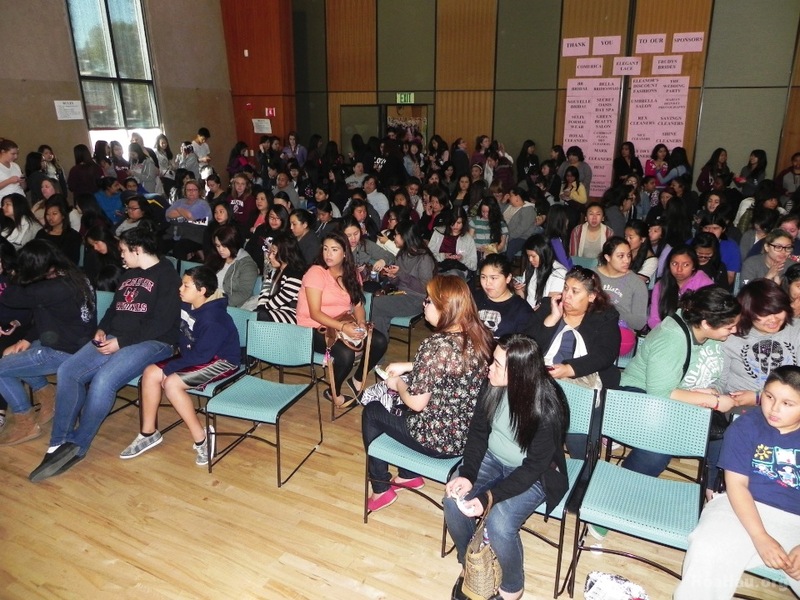 While they wait, they are given a chance to win prizes in a raffle. To the far left of this room, mini bottled water and snacks are available, of course free of charge. On the far back wall, list all the sponsors to this year’s prom dress operation. 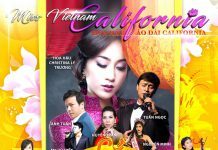 Vietoday and their reporter Ngoc Thuy were there to do news coverage on the event. Free for all snacks and bottled water. 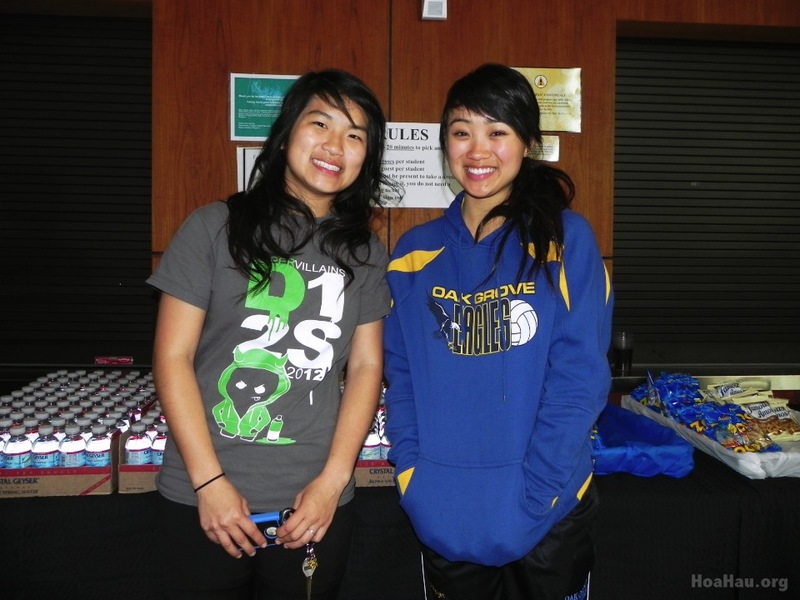 Stephanie Dang and Sarah Nguyen are High School seniors at Oak Grove High. They are awaiting for their numbers to be called. 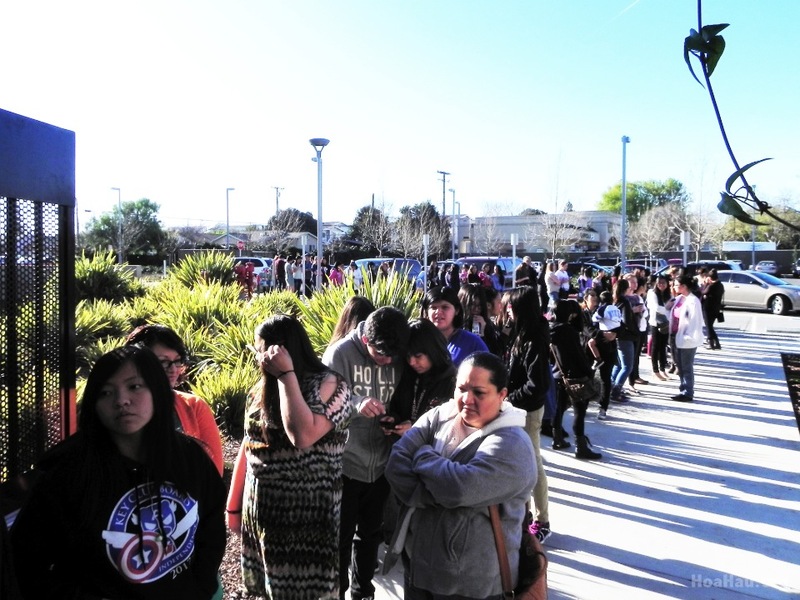 They arrived center and waited in line at 9:15 am. Laryssa and Amber are friends from San Jose High. They arrived together and waited in line at 9:00 am. They happily smiled for the camera while they patiently wait for their numbers to be called. 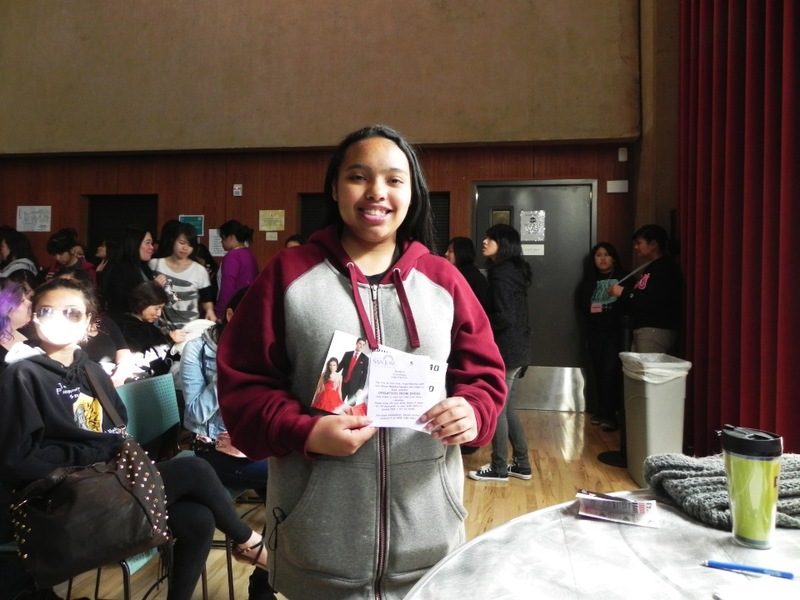 This lucky raffle winner is Maya Sally and she is from Santa Theresa High. She is holding her prize for free Hair/Makeup. 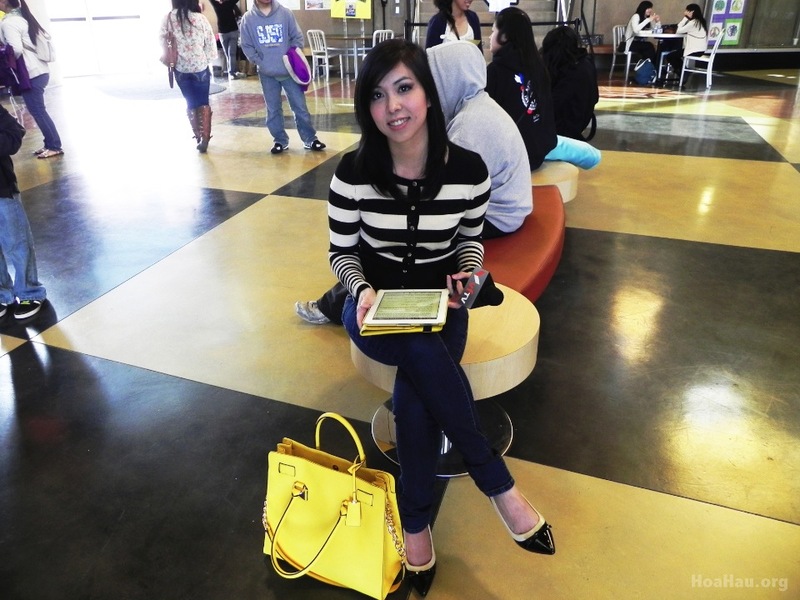 Can you believe she came to the center and waited in line at 6:00 am? This picture was taken around 10:00 am…yikes! Finally we are in the room where all the dresses are. 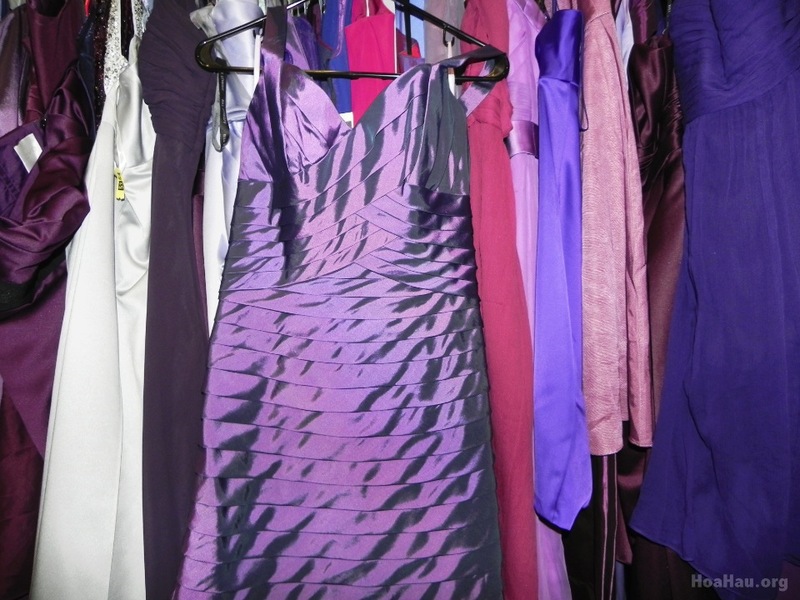 There were at least 8 racks of dresses, coordinated by color. Here you can see 4 of the racks. 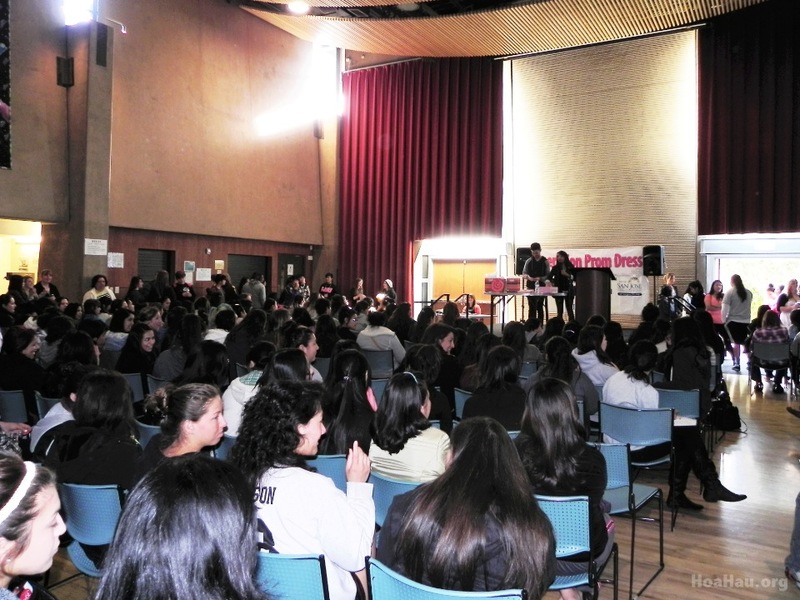 Only 20 girls were let in at time. Once in the door they are given only 10 minutes to pick out three dresses max to bring to the fitting room. In an unfortunate event, where they don’t find a dress, they will have to redo the whole process from waiting in line to waiting to be called in all over again. This beautiful sleek green gown was picked as soon as this picture was taken. Two of our very own! 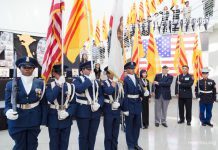 Le Tran (A-Hau 2012) and Linda Tran (Hoa-Hau Ao Dai Bac California 2008) volunteered in this year’s Dress Operation. If you know what color you like you can go directly to the rack to save time. Once the girls are allowed in the dress room they are give only given 10 minutes! These lovely ladies apparently have found their perfect prom dresses. Kenyatta Dorsey and Michelle Lee, both from Piedmont Hills High arrive at the Seven Trees Community Center as early as 7:00 am. They are best friends since childhood. It appears that pink is the most popular color in the room. The disorderly clothes hangers proves it. 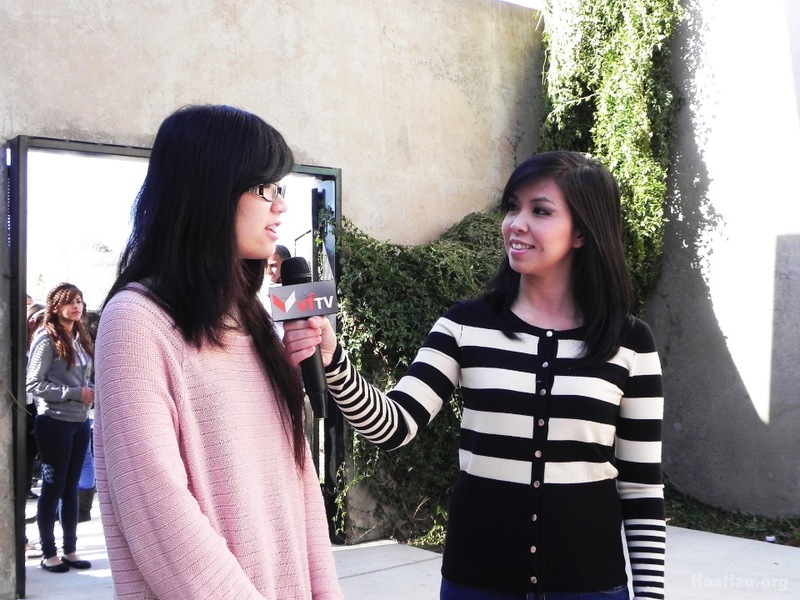 Council Member Madison Nguyen (in purple) is being interviewed by VFTV. 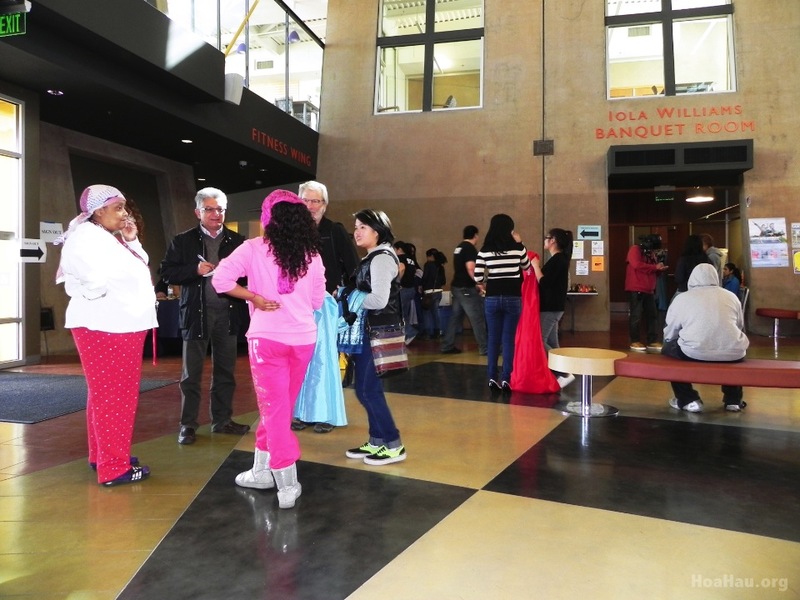 This beautiful room that we are in is inside the Seven Trees Community Center in San Jose, California. 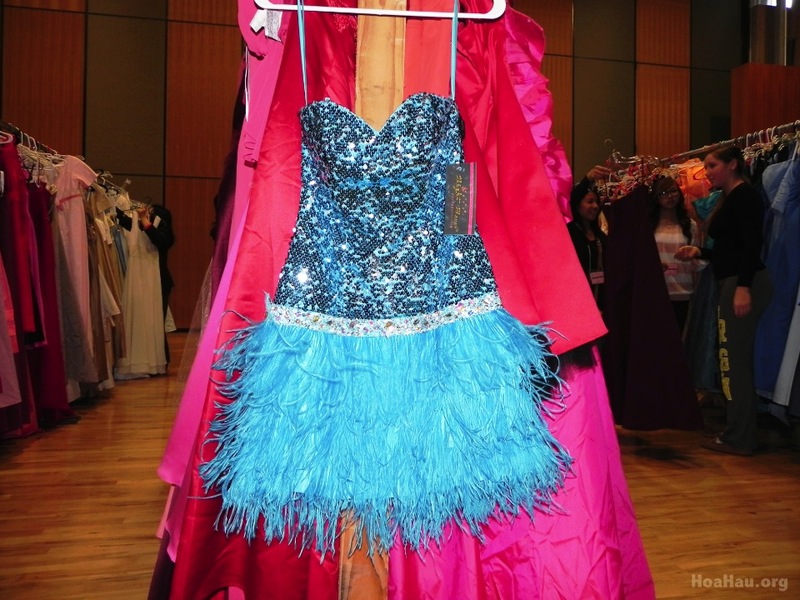 This short and flirty number dazzles in ostrich feathers and sequins. It was no surprise this dress was immediately whisked away. If you want a new dress, you can easily find one. 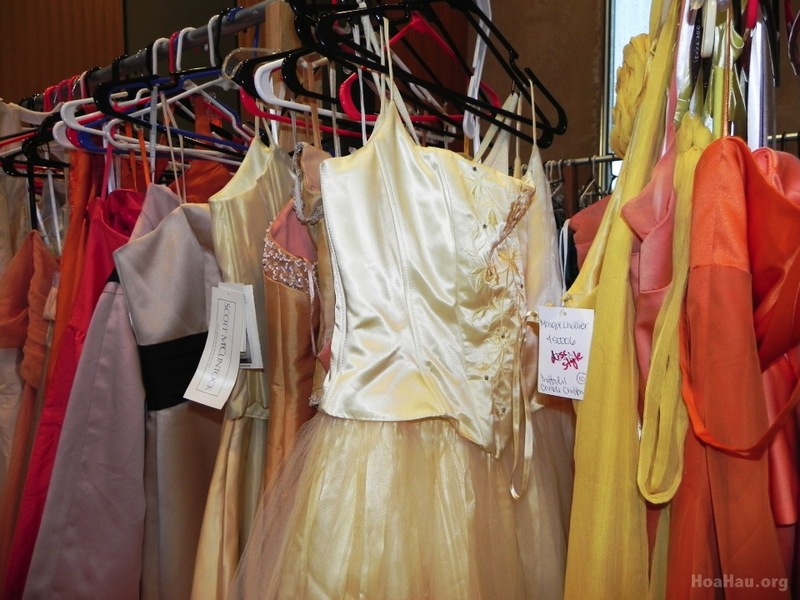 About half of the 2000+ dresses that were collected, were brand new! Green, blue, and chiffon! Go to your prom like a princess in this floor-length bedazzling gown. 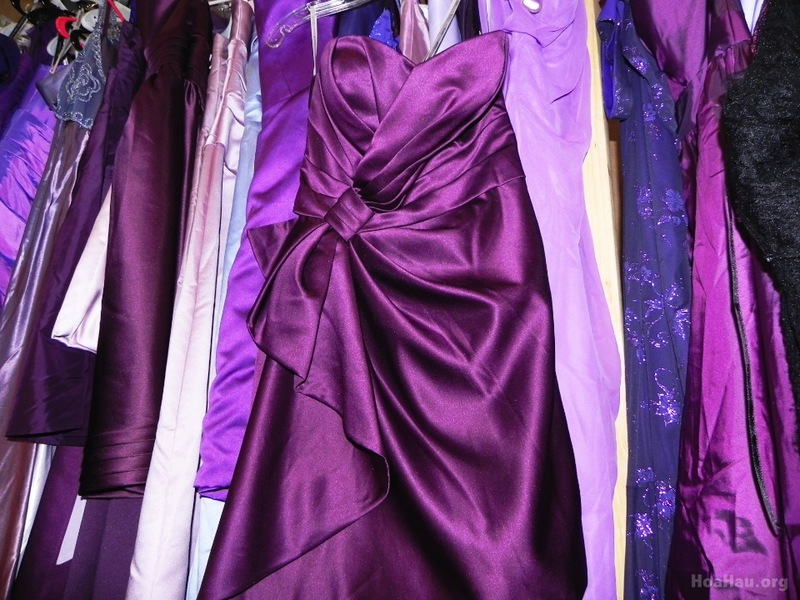 If you like purple you would fall in love with this silk satin dress. You can see the girls, but there are 20 of them in the between the racks. 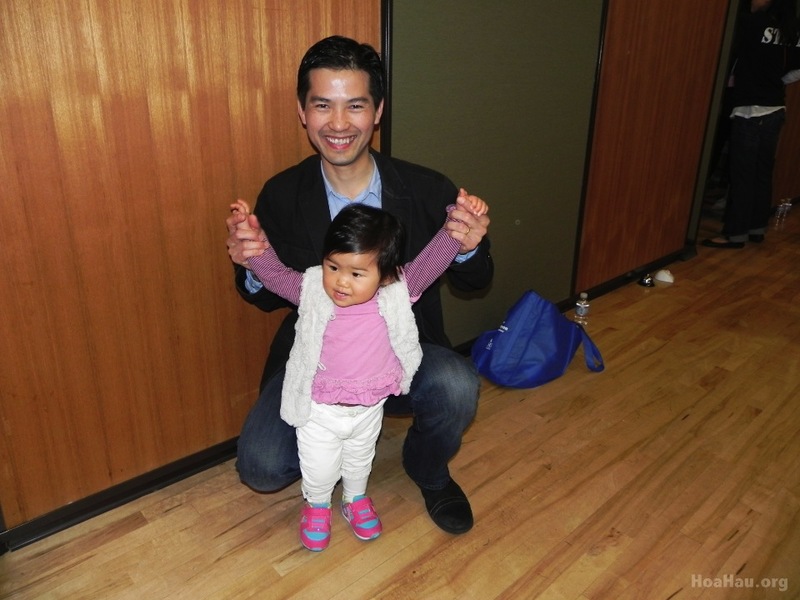 This wonderful man with his bright, big, warm smile is our Council Member Madison Nguyen’s loving husband. He’s there with their baby daughter. If you want to look like a beautiful bride on your prom…good news…you can! Almost every girl has a black dress in her closet. If she doesn’t here is her opportunity to own one. 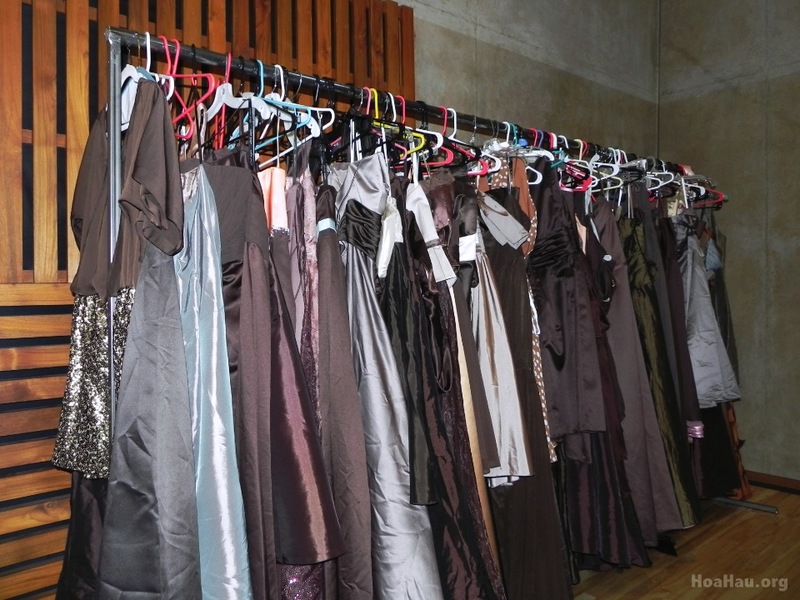 There were to full long racks of black short dresses, black long dresses, black puffy dresses…you get the picture. If you are an earthy tone kind of girl, here is the rack to be at. Light brown, dark browns, browns with a little bit of silver or black…your choice! These three young lovely ladies have found the one! They hold it proud and high for the camera. 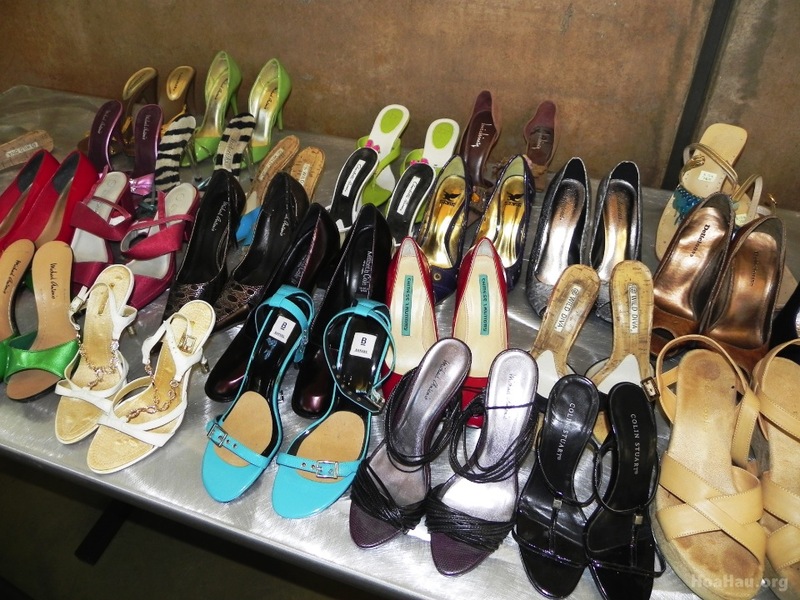 There were shoes for the picking too. Who wouldn’t like to interview the lady in red? Kenyatta Dorsey and Michelle Lee are being interviewed by San Jose Mercury News. 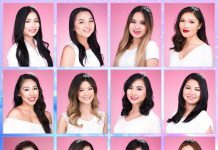 Here they are answering a few simple questions about their dresses, the event, and of course their upcoming prom. Lena Quach and Linda Nhieu are waiting in line to get into the fitting room. They have been at the center since 8:30 am. Three hours later then finally got to try on their dresses. There were two fitting room areas. This is one of them. Ladies…please hold your dresses! Thanks! 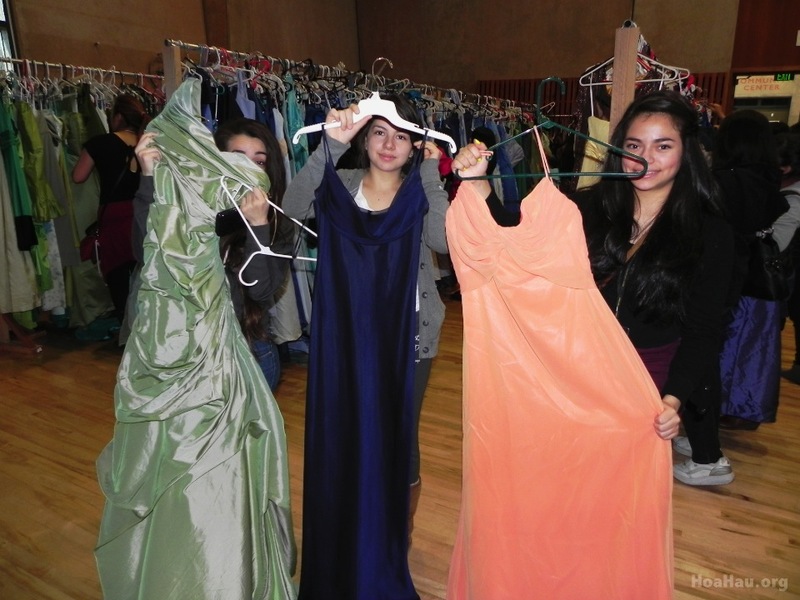 Erika, Maria (one of the girls mother) and Cynthia have found their dresses. They are from Downtown College Prep High School and they arrived at 7:45 am. 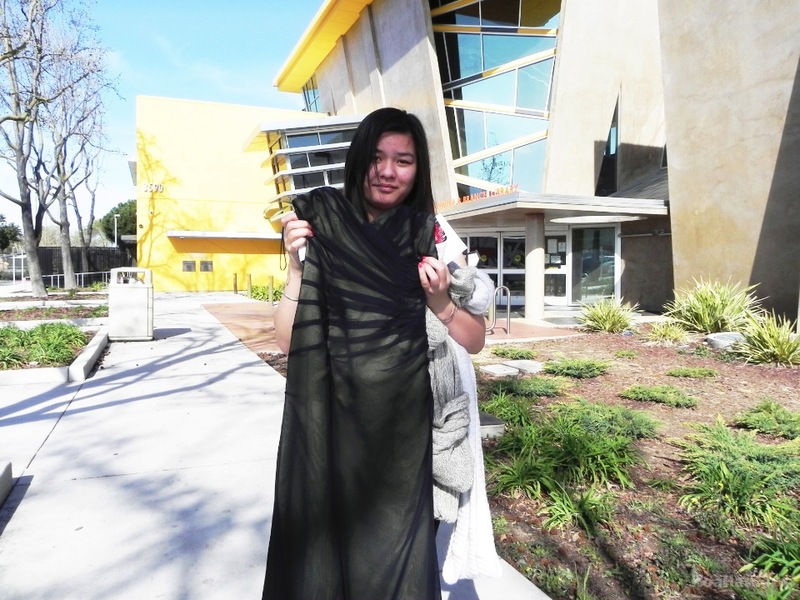 This girl was fortunately to walk away with the dress that she plans to wear to her prom. 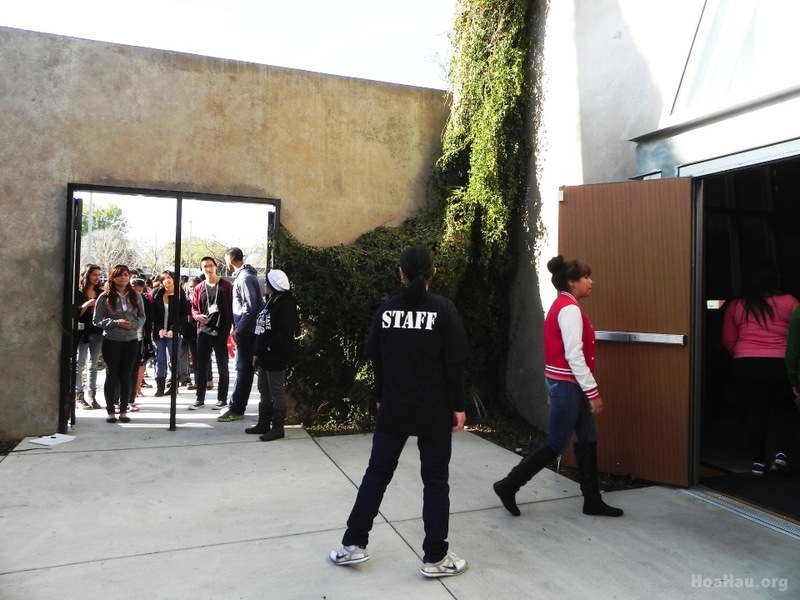 Around noon, the line outside looked like it never changed. 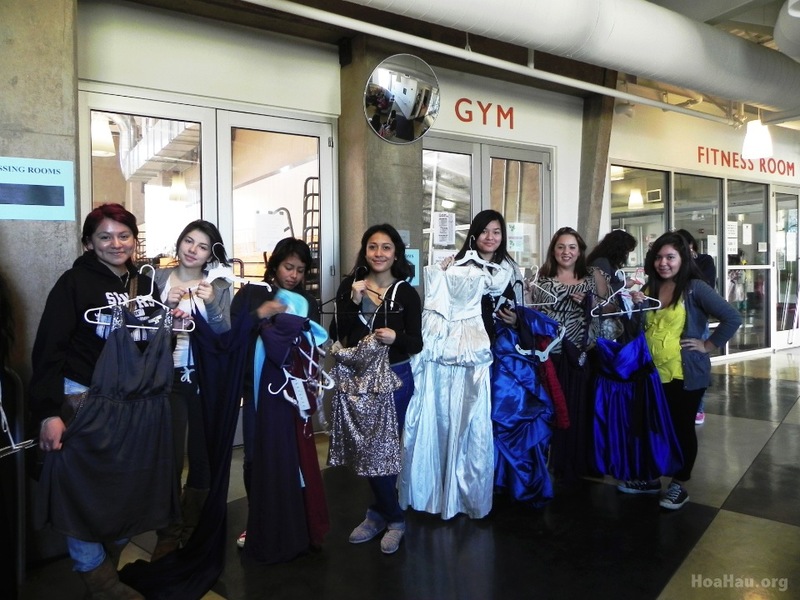 In this Prom Dress Operation more than 2000 dresses were collected and 800+ girls showed up.